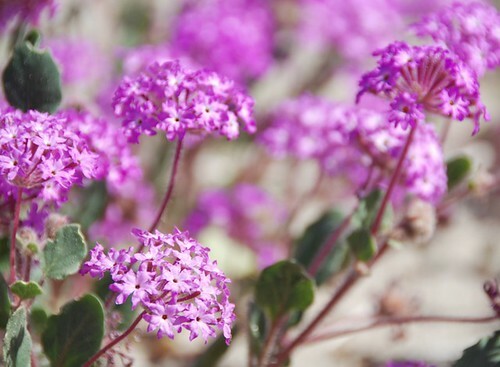 Food Blogga: What's Better Than Desert Wildflowers? Shrimp Tacos, That's What. 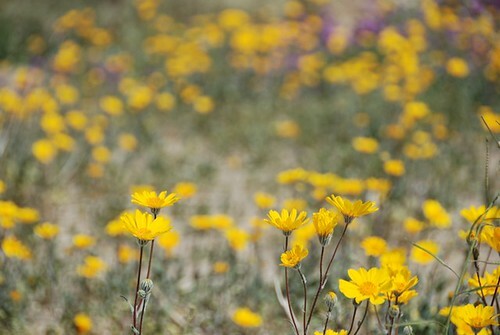 What's Better Than Desert Wildflowers? Shrimp Tacos, That's What. Every spring Jeff tries to convince me to drive the 2 ½ hours to see them, and every spring I find some excuse not to. It’s not the drive (I love driving). It’s just that we have flowers everywhere we look here. Plus, I'm a fall foliage girl. 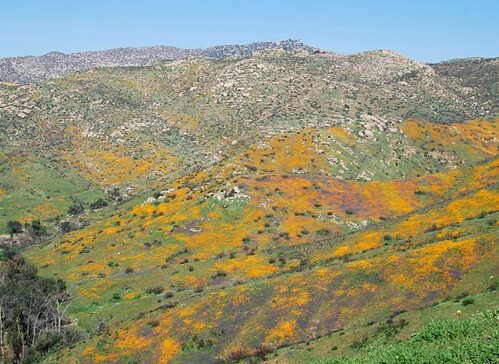 Two weekends ago, however, San Diego was all abuzz about this being the BEST wildflower season since 2005 (because of our unusually high rainfall-- a whopping 4.43 inches since last July). Jeff asked again, and I just couldn't say no. So we packed a lunch, grabbed our maps, and drove to Anza Borrego Desert State Park. “You mean the weeds?” I said. “They’re not weeds, they’re wildflowers. Look at them all!” he said. “They look like weeds,” I said. 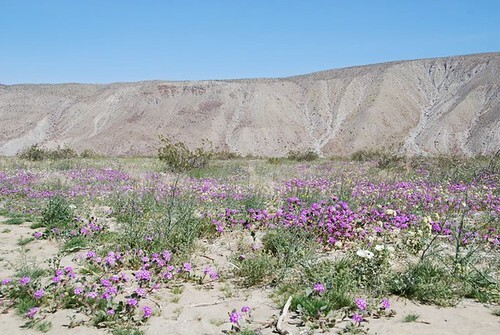 Anza-Borrego is technically a desert, which in my translation means sand with weeds in it. Based upon the “oohs” and “aahs” I was hearing, and the obscene number of Nikon D80's snapping pictures, it seems I was the only one not impressed. OK, I admit, there were some lovely flowers, but the best part of the day was the ride home. 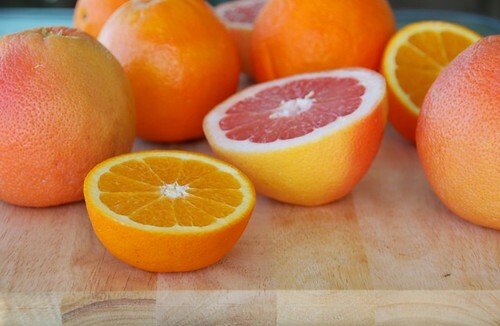 We stopped at an orange and grapefruit grove where we bought a 15-pound bag of freshly picked navel oranges for $3 and a 15-pound bag of pink grapefruits for $4! Fresh fruit at a bargain price—it just doesn’t get better. I was very impressed. The scenery was spectacular; we finally saw the “sea of brilliant colors” we were promised, and it was awe-inspiring. We even spotted a few idyllic farms. To make the salsa, simply combine all ingredients in a medium size bowl and toss gently until well combined. Place the shrimp in a large bowl with olive oil, salt and pepper. Toss well to coat and set aside for 5-10 minutes. Heat canola oil in a large skillet over medium-high heat. Add shrimp and cook 5 to 6 minutes, turning to ensure that they brown evenly on both sides. Squeeze the juice of 1/2 lime over the shrimp and sprinkle with cayenne pepper. Toss to coat evenly. Remove to a plate when cooked. To assemble tacos, heat tortillas in a dry skillet over medium heat for 1 minute per side or, using metal tongs, simply hold over an open flame until warmed and slightly charred. Place three shrimp on each tortilla; serve with salsa and extra fresh cilantro for garnish. Serve immediately. We have been planning to do what you and Jeff just did for more than 5 years. The only difference is that we would have to fly, so the logistics are a bit more complicated. I am glad you enjoyed the day. The photos are lovely and the fruit was a real bargain. I have to admit, Susan, when I saw the words "shrimp" and "tacos" together, I was dubious. But the salsa made me a believer. This sounds tart and lively and delicious! Susan, I love seafood tacos, especially shrimp. That citrus salsa looks so fresh and lovely too. A great dish to welcome Spring! you know, we had planned on driving out to the desert this past weekend to see the flowers but decided to put it off until this weekend. we heard that it was like a sea of cars out in the desert! i still want to go, but i think i'd be willing to settle for some great shrimp tacos and a $4 15lb bag of grapefruit! oy, this makes me miss california, and all it's gastronomic glories. I chuckled when I read your and Jeff's conversation :) ... but that ocean of flowers, got to be paradise on earth! Susan, excuse me being nosy :P... do you upload your photos via Blogger (apology if my guessing wrong)? I used to use Blogger, but my photos lost some "charity", so I switch to Flickr... 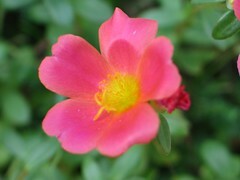 Your photos are brillant, so I think they will look even sharper from Flickr. The food sounds great! I am a bit cautious around shrimp (I'm still breaking out of my shell with seafood...ah bad puns at 7 AM), but this sounds like something I would very eagerly try. I love grapefruit, I love shrimp tacos, and I love long car rides -- but right now, on this oh-so-bleak Rhode Island morning, I'm most of all enjoying the virtual view of those hillsides covered with wildflowers. I prefer the shrimp tacos. They look so good - I can't eat a weed but those tacos I sure can! Too funny that the fruit was better than the flowers. Good for you for going nonetheless! Seafood tacos are "da bomb" and a little spice is nice too! Great combo of ingredients...Killah! Love those shrimp tacos. Sometimes I don't think people in other parts of the world don't quite get the fish taco thing. They're great! You couldn't get me out there to the desert. I'd rather go up to Carlsbad and sit and stare at the flower fields! Given my interest in flowers other than the tropical sort (seen enough of those), I probably would have been joining the rest of the digital camera-toting crowd. ;-) Really nice! But it's the complete SCORE of 30 pounds worth of citrus for only 7$ that floored me. I'll trade you however much you want of zeppole for some oranges and grapefruit anytime. Thanks for stopping by! I just started making shrimp tacos this year and I love, love, love them. I can't wait to try your salsa! despite the massive amount of tacos i've consumed in the past week, i will still gladly eat several to a dozen of these. shrimp tacos with citrus and avocado are *clearly* better that colorful desert weeds. I'm the type of guy that would have been impressed by the "weeds." I love splashes of color wherever I can find them, and that valley shot is majestic! The shrimp tacos have some pretty fetching splashes of color, too! Oh Gawd! That does look like the best shrimp tacos I have ever seen! Those look very very good. I'd be excited about a bunch of those oranges, too!! I love shrimp tacos, and these sound fantastic! simona-I hope you enjoy it if you do go. terry-Yay! Another shrimp taco convert! kalyn-I've heard Utah has good fall foliage too, but I'm skeptical since I grew up in New England. I'd still love to see Utah, though. susan-It was refreshing and light. amanda-Go early, if you do go. Seriously. The traffic is ridiculous. cmoore-I know. It's so beautiful. mike-Yeah, plus for me, foliage means one place: New England. It's a great and tasty way to get accustomed to seafood. lydia-Glad to share a little spring weather with you. lore-Trust me, they don't. My family thought I was insane when I first mentioned them. judy-I hope you like it. The citrus compliments the seafood deliciously. michelle-I like you. 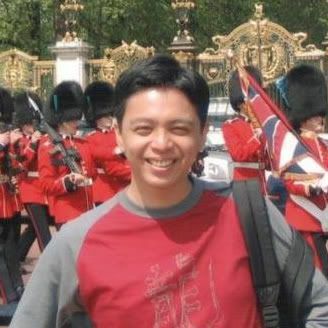 :) Thanks for visiting. deborah-And they were unbelievably juicy and delicious! I love shrimp tacos, and I think I'll take the ride just for the fruit! I've learned over the years that there are desert people and then there are the rest. Some people just flip over the subtleties of the colors of the desert, and others prefer the acid colors that smack you in the face. Both are fine, as long as you know which one you'd prefer a long drive to go see! Sounds amazing--all of it! The flowers, the adventure...but ESPECIALLY the tacos. Dammmmn. I'll take shrimp tacos over the dessert and wildflowers any day. But it's all part of the big picture: Jeff gets his wildflowers and you get the tacos, one followed the other. What a great story! The picture of the shrimp tacos is gorgeous and your salsa sounds divine! Also, I love jicama in anything and I always forget to put it in my salads. Sounds like A LOT of driving! Not my favorite thing to do either, but I do love a good nature hike - even better with fresh (cheap!) produce! Thank you for the Shrimp Taco recipe. We will be making this soon. Now that the weather is sunnier & warmer, these tacos seem like the perfect way to pay tribute to the brighter climate. Gorgeous flowers and your shrimp taco recipe sounds delicious. What a funny post! Even though the flowers didn't meet your expectations, the photos are beautiful! Shrimp tacos look good, too! toni-I guess I'm not "desert people" then, huh? cakespy-I'm with you on that! anticiplate-I love jicama with citrus-- such great flavors and contrasting textures. amy-There are plenty of places for a vigorous hike near Anza! margot-Citrus and seafood really go well together. yankeesoaper-Those tacos were the highlight of the day. Thanks for visiting. tracy-Aw, thanks; I'm glad it made you laugh. Beautiful pictures! I'm totally trying this,....it's making me hungry! I also made the Shamrock Shake, your version :), on St. Patty's night. YUM! I put crumbled thin mints in there too, though! Shrimp tacos are one of my favorites. I really like the sound of that citrus salsa! It sounds like it would go really well with the shrimp tacos. OMG...that is a great story. I was cracking up imagining you looking at the purple "weeds"-- unimpressed. But like you said five hours of driving seems a small price to pay for those delicious looking tacos! I'm bookmarking this one to try. Thanks for the shrimp taco recipe, I'm a big fan of fish taco's, I order them everytime I go to this local restaurant near my house. I'll definately be making these!! Delicious looking taco you have there! Oh Susan I love your humorous post titles and giggle-inducing stories. I agree about the wildflowers. When I lived in Arizona, I did very much enjoy one event - right after a rainfall, the light green misting of grass over the foothills always made me sigh. Personally, I find the grand views of mountain scenery and large scale color striation much more enjoyable than closeups of the brown vegetation. I'm with you . . . I think the tacos (and that salsa -- yum!) would have gotten more oohs and ahs out of me than the weeds-um-flowers. Although that 'sea' looks spectacular. I'm a fall foliage girl myself, but that far away shot of the sea of color is pretty nice. The shrimp tacos are even better...fresh fruit and avacados obviously being the stars. What Alanna said about the wildflowers! Love the shrimp tacos, love the picture of the hillsides covered with the flowers. In fact, lots of great pictures with this post. I love your citrusy salsa, tasty and brilliant! OMG, what incredible landscapes! Those flowers are really magnificent! Thursday, I ate pork (marinaded in Adobo paste) tacos with guacamole and cheddar... Wonderful! Those are colorful weeds.. but i'm like you, it won't be a good day until i get some tacos in my system. haha. Looks delicious! Oh boy! I do not get people who love the desert. People who love shrimp, though? My soulmates, heh heh :) I'd love to try it in a taco someday! I'm with you, the citrus was the best part of that trip! Awesome tacos! I loved the pictures with the wildflowers. Your trip sounded great. The desert pictures are gorgeous, you`re just getting better and better each day with your photography! I`ve had fish tacos before, but never with shrimp, must give it a shot! Susan, all I can say is, "I'm jealous. I'm very, very jealous." "Oooh, look at all the purple weeds"
If you wanted to make the FISH taco version of this, what type of Fish do you think would be the tastiest? lydia-yay! With the crumbled mints, it must have been awesome! kevin-The citrus really compliments the shrimp well. marie-Great! I'm happy to hear it. rachael-Thanks so much! I appreciate that. lia-A girl after my own heart. elle-Ahh, nothing beats fall foliage. amy-Yup, I was a happy camper after that. zen-I like the way you think. brilynn-I'm still eating that citrus! cris-Why, thanks so much. I appreciate that. the chef-I like mahi-mahi and tilapia the most for fish tacos. They're white, flaky fish with a pleasant, mild flavor. I made this recipe last night and it was superb!! Fresh & juicy with a kick, really wonderful!! I'm secretly happy my dinner guest declined because I now have leftovers for lunch and I can't wait! Despite living in South Africa for the 1st 30 years of my life, I never went up to Namaqualand to see our equivalent of the desert erupting with wildflowers. 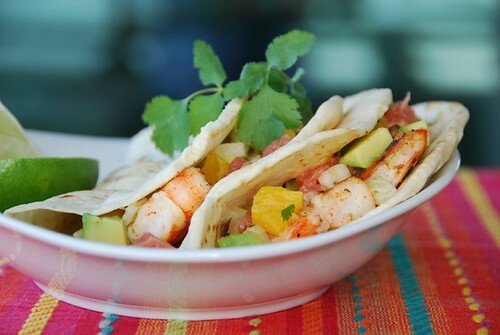 I LOVE the shrimp tacos and just look at how beautiful that citrus is!